The food trip shaped like a skillet. I had given the children 2 “options” for the last day of the trip. 1) We could pick up a “mystery trip” packet from the CVB in Altoona which would contain a driving tour scavenger hunt in the Allegheny Mountains, then a hotwings challenge that evening at the amusement park put on by all of the local restaurants and finally, bat hunting at the church… or 2) we could leave early and spend some time swimming at their great-grandparent’s cottage on the way home. The children chose option 2 and we decided that, although really too dark to bat hunt, we would try to fit in the bat hunting the day before after the day at the amusement park. My sister-in-law (Jorden and Ashley’s mother, Sharry) called the day before we were to head home and asked if we wanted to stop in Pittsburg to visit her brother, Steve. Steve offered to get us in to the Carnagie Science Center under his membership pass. It sounded great and this detour would give Jorden and Ashley an opportunity to visit their uncle and cousins. 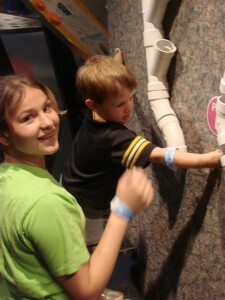 The science center, located across from Heinz field (Where the Steelers play) on the river was awesome! 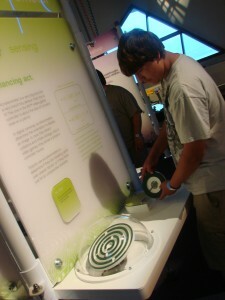 There were so many interactive things to do. We saw a train exhibit as big as my house. There was a new robot exhibit to be opened on Saturday and Justin was kinda sad that we were going to miss that so he stood and watched the robots from behind the rope. Amazingly enough, they unhooked the ropes and opened the robot exhibit for 2 hours to do some “beta testing” with the crowd. Wow! We were the first ones to see the exhibit. Here we drew on a screen with our finger and watched the robot arm create the words “skillet trip” by placing beads in divits while a table spun around. We watched a robot play basketball on a full size court – he rarely missed. You could play air hockey against a robot…. um, good luck with that one! 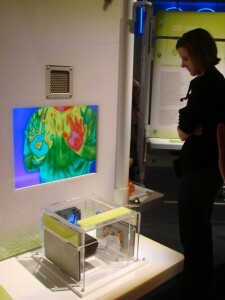 There were interactive games, an infrared heat/cold sensor, computers, and much more. We went to a show about flambe which went with our “Skillet Trip” theme. 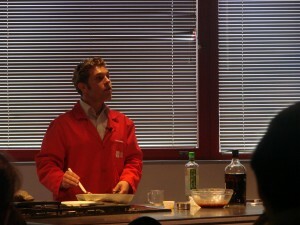 The guy talked about the science involved in making the flame from alchohol. After the show he served his flambe creation on top of ice cream to the crowd. The kids created their own piping lines, raced solar powered cars, played in a cloud maker, and much more. I was sitting down filling out a survey when I heard the words “Aunt Dawn” in different tones to sweet music bouncing off the walls. Everybody in the place heard it. Matt had put those words into a drum set and was playing them fast then slow, high pitched then low pitched. It made me laugh. The kids went in a simulator and took a ride down the Amazon River in a spaceship. We were sad that we had to leave as we all could have spent much more time there. The robot arm creates the words “Skillet Trip” that we had drawn on a computer screen. The robot creates a duplicate of our picture by placing beads into divits as the table spins. The scientist chef teaches us the science of flambe in the Kitchen Theatre at the Carnagie Science Center in Pittsburg, PA. This is an infrared heat sensing image of Jorden’s hands. One he placed on the cold pad (the blue image) and one he placed on the hot pad (the red image). 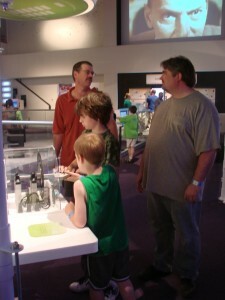 Steve along with his oldest son (John) and middle son (Scott) talking to Justin at one of the stations in the robot exhibit. Jorden playing a game at the robot exhibit. He was very good at it. 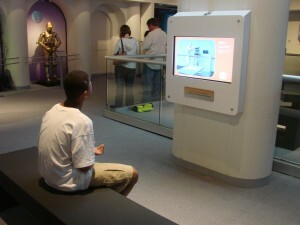 Matt learning about famous robots. Ashely kept Steve’s youngest son (Nathan) occupied. She loved being able to spend time with her cousins. 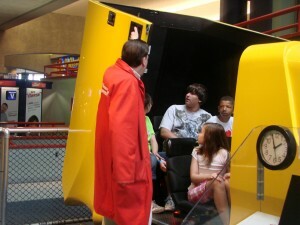 Ashley, Jorden and Matt getting in the simulator to take a ride down the Amazon in a space ship. After about 3 hours at the science center, we left for home. We now had about a 6 1/2 hour drive plus breaks until we arrived at the cottage near Wayland, MI. We really wanted to make a stop at Primanti Brothers restaurant which is a famous sandwich shop in Pittsburg. They put the entire meal between two slices of bread including fries and coleslaw. But we were really pushing the time and Jorden wanted to make a stop for fireworks so the kids made sandwiches in the car from the cooler as we drove. Later that evening we made a stop for fireworks and McDonalds before we hit the Michigan border. I dropped the kids off at the cottage around 10pm to spend time with their Great-Grandparents then Justin and I went home to spend the night in our own bed. Oh, that was nice! We picked the kids up the next day from the cottage at 2pm then drove out to Holland as Ashley wanted to try the Grand King Chinese restaurant that she has heard so much about. They have a stir fry mongolian grill, an open flame grill, a taco bar, huge salad bar, 6 chinese food bar stations and a dessert bar. It is huge. It was here that Jorden and Matt tried squid and both loved it. Jorden made a huge plate of it and ate it all. Yuck. 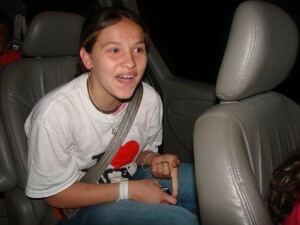 Then we went back to Wyoming, dropped Matt off at his house and picked up Jorden and Ashley’s younger brother, Bryce. We drove all 3 kids home to Manistee. Once in Manistee, we had ice cream at the reknowned My Way Depot ice cream/candy shop famous for their “build your own sundaes”. It was absolutely fantastic… and I would say that even if my brother didn’t own it! After awakening from a deep dark sleep, we decided to go to an amusement park that day. We rode many rides. After the amusement park we went to hunt bats. In the event of hunting bats we had to go to the middle of nowhere. It was in an unethically immoral cemetery that scares little children, and big men. As we were walking through the cemetery we noticed that one candle was lit, and nobody was around. All of the sudden the dead started to rise from their dark graves. One grabbed Matt and knocked him out. Now that it was peaceful, we put him in the car – since he was still breathing. We figured it saved him from crying, so we didn’t wake him. The ghosts began to start haunting, so we all high-tailed it to the Camaro. After waking Matt up, we told him what happened. He didn’t believe us, so we brought him out and showed him. Then he believed us, and was terrified. Once again, we were low on gas. Luckily we made it alive. I am so horrified that I can’t write much on this subject though. The 2nd “Cliff” teaching Matt how to shoot the canons. After waking up off the streets, we ventured off into Gettysburg. First on the agenda we drove through the town of Gettysburg to get to the guide. Once we received our guide, we all piled into the Camaro. Proceeding from the parking lot we drove past Cemetery Ridge. Our tour guide happened to be Cliff Claven, the ex-mailman from Cheers. When we got to the battlefields we noticed a large pile of weaponry. We were very curious as to how they worked, so we grabbed amunition and began to load them. Matt and I fired the first two shots. Accidentally, Matt shot Cliff — so I became the leader. So we took the guns away from Matt, and let him use the cannons. Then we realized it wasn’t such a good idea because he didn’t know how to use them. So we found a random tour guide, who coincidentally was also named Cliff to show him how to use them. After learning how to shoot the cannons we decided to shoot some buses. Unfortunately for the owners, it was full of fireworks, so it erupted in an epic explosion. A few terrorists were walking down the street next to the buses. They saw the explosion and thought we were starting battle with them. They grabbed their guns and started shooting towards us. (Thankfully there were no airplanes around.) So we grabbed our guns and shot back. 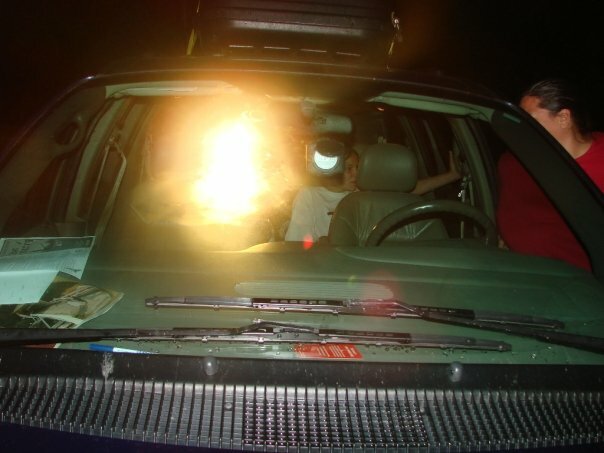 When we got in the car for protection, and to use as a weapon, we noticed it was low on gas. So Cliff pointed out a great place to get gas. When we drove up, we could not pump our own gas because we were in an epic battle for the right to shoot our own guns. For that reason the man inside came out and pumped it for us. He was faster than a jack-rabbit. We floored it out of there squealing our tires all the way down the street. When we got back to the battle field we began to do donuts in the field. Doing donuts created an impenetrable dust storm so that the enemy could not see where to shoot. After leaving and driving around behind them and ran few over and Matt shot the rest with a turret gun – which caused us to win the war. After that, we were famished – so we decided to go to General Pickette’s buffet. We began to eat when Ashley let out a horrific death screech. We realized that she was choking on spaghetti that the cooks had purposely cut too long. After laughing at her, we decided it would be a good idea to help her. Aunt Dawn gave her the Heimlic Maneuver, which probably saved her life. Immediately we left the restaurant which had very delicious food. We all got in the Camaro and drove to Little Round Top and practiced our target shooting, just in case there was another war. In the distance we saw a stand, but not just any stand – a stand that had pamplets for a hill that you could roll down. We decided to go to it. After experiencing the pleasure of rolling down a hill, we decided to wander off and explore the magnificent country side – or so we thought. As we left, we noticed a small white animal on the side of the road about a mile ahead. As we got closer we noticed that it was a white donkey. This was not just any ordinary donkey — this donkey had fierce bodyguards. These were not just any fierce bodyguards. These were rabid dogs that could rip an elephant in half with one bite. As Matt and I wandered over to the donkey to pet it with our fully loaded elephant rifles, the rabid beasts came out to kill. The burrow on the side of the road before the rabid beasts attacked. As the dogs were running at us we fired shots which hit them but bounced off causing no damage at all. As we proceeded to run like big strong men would in a situation, they followed us getting closer and closer with every second. As we leeped valiently through the Camaro window, I hit the gas and floored it out of there. The dogs jumped on our roof and began to tear through the metal roof. One of the dogs claws pierced Matt in the throat. With Matt still living, I stabbed a dagger through the dogs head and killed him right then and there. Without any time to stop at the hospital, I performed surgery on Matt while driving at 200 miles per hour on the back roads. This was no biggie, because I do it all the time. He fortunately survived after I put him through a few five-minute physical therapy lessons in the car. After that he was fine and had no scars. After that we went to see Flight 93. After that great experience we left and drove to our hotel. When we got the hotel we noticed a bad smell in the room. We looked around for the smell and realized there were two dead animals under the bed, and one under the dresser. So we checked out, and went to a fabulous Holiday Inn Express. When we got in the room, we noticed it was perfect – it was the best franchise to stay in. We slept great all night after all the great adventures that day. 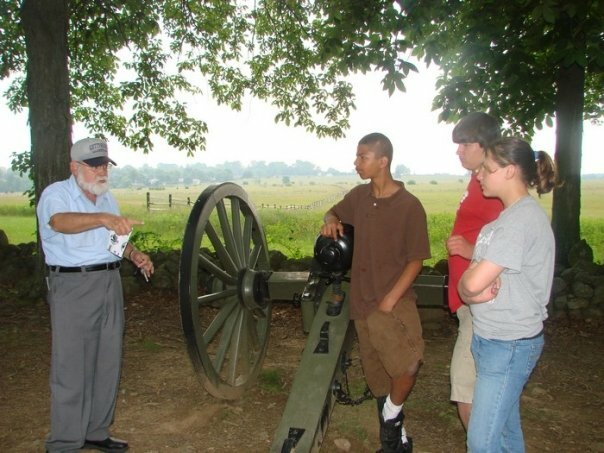 All of the sudden we realized that we forgot to drop off our tour guide Cliff, so we brought him back to Gettysburg then returned to our hotel. Then we fell into a deep dark sleep. This is the roller coaster upon which I conquered my fear. Ashley, Jorden and I are in the last car on this drop. Previously on the Skillet Trip – The Matt Edition we had just gotten done almost being killed monster/dog/rabid beast. Then we went to the hotel, got in the hot tub, and went to sleep. I woke up the next day, ready, refreshed, and scared to go on the roller coaster. 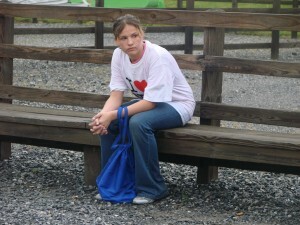 Aunt Dawn made a mistake and thought that the park opened at 9 instead of 11, so we had a few hours to ponder our fate. We went to breakfast. Jorden was not that happy because they didn’t have the omelette eggs, but Aunt Dawn and I were happy because they had sausage. 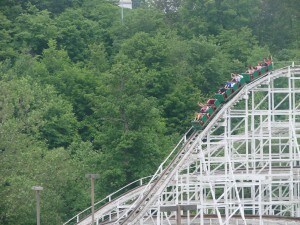 After breakfast we got in the car and went to Lakemont Park – family excitement since 1894. I convinced Jorden and Ashley that I was scared of going on the roller coaster, since I don’t like the quesy feeling in my stomach. The first ride that we went on was the Monster. As we were in line for the ride we got splattered with oil and then we got on the ride and me and Jorden – we were not expecting it to drop so fast. We screamed – in our manly voice. 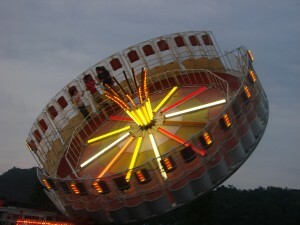 We went on the Gravatron which is a big wheel where your as you spin you get stuck to the wall and then it turns completely on its side where you go from being on the ground to being way in the air. Ashley, Jorden and me on the Gravitron. After the Gravatron, they convinced me to go on the roller coaster. As a sat into the car, my heart went down to my stomach. On the way up I heard a tick tick tick tick tick sound and Ashley told me to just get used to it. As we turned the corner I said to Jorden in a very confident way, “there is no turning back now”. He smiled and gave me a knuckle touch. The knuckle touch gave me a sudden star-powered burst. Then the first hill was one of the best things that ever happened to me. We got the biggest quesy feeling I ever had, but the whole time Jorden and Ashley were laughing, I decided to man up and enjoy the roller coaster. I kept on going every time that Jorden and Ashley wanted to – and most of the time I wanted to. Ashley got sick of the roller coaster by the time it was lunch. It rained after we got back from lunch – but luckily we had our bathing suits, so it was almost as if we were already in the water park. Unfortunately, the water park was closed. Jorden was broken-hearted when he found out that the paddle boat rides were closed. We went on the bumber cars for about half an hour. While we were in the bumper cars, instead of trying to hit cars we were trying to avoid them and do doughnuts. Jorden said that we shot a plane down while we were on the roller coaster and hijacked it. I do not quite remember that because my eyes were closed so that I would get that butterflies in my stomach more. We went on a whole bunch of kiddie rides and the went on the oldest roller coaster in the world. 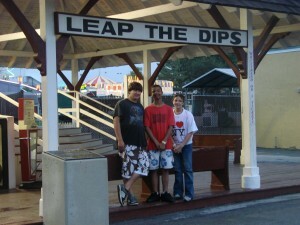 “Leap the Dips” – The oldest roller coaster in the world. Then we went on the big roller coaster and we played Marco Polo/Hide’n Seek with the ladies who worked on the roller coaster. We screamed like girls while going up the hills, instead of while going down the hills. Then at the end of the day they played a Backstreet Boys song and I danced to it all night long. But now me and Jorden are convinced that we are going to make a music video with the same exact settings. We had a very fun day, but if you want to hear more read my blog tomorrow. 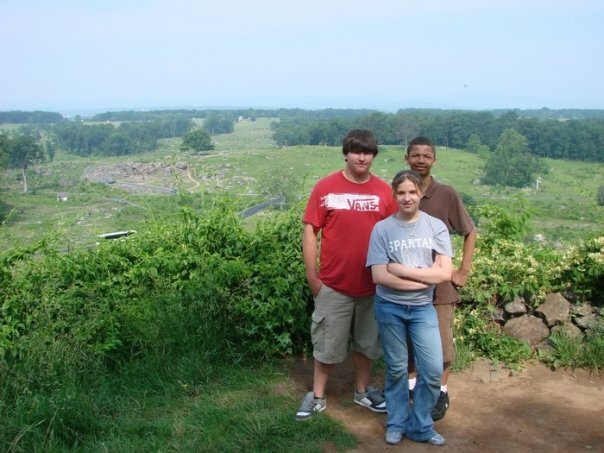 Jorden, Ashley and me at the peak of Little Round Top at Gettysburg. Today we went to Gettysburg. We had a tour guide. Cliff our tour guide showed us the battlefield. We walked around and told us about the battle between the north and south, Union and Confederate. We saw the Michigan monument. We saw Cemetery Ridge where Lincoln gave the Gettysburg Address. We saw Little Round Top where General Sickle was supposed to take over the first day. On the way leaving we saw a turtle in the middle of the road. Our tour guide showed us where to get gas and showed us some houses that had battle damage. Then we went to General Pickette’s buffet. Legend says that General Pickett was friends with Colonel Sanders. They had really good home-made bread and good spaghetti. Aunt Dawn’s favorite was the chicken parmesan. They had terrible lemonade though – don’t go there for the lemonade. I had mash potatos and macaroni. Ashley almost died eating spaghetti. Me and Jorden had to use the restroom, but Aunt Dawn felt like being a little cruel, so she let Ashley decide when we could. 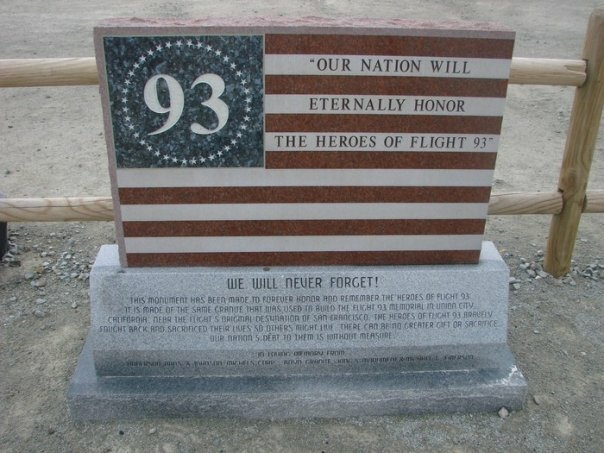 We were in Shanksville and we went to go see Flight 93. It was temporary memorial and lucky for us there was porta-potties there. There were four planes that went down – 44 people died, 4 of which deserved it. Hopefully we are not related to any terrorists that would be offended by that. 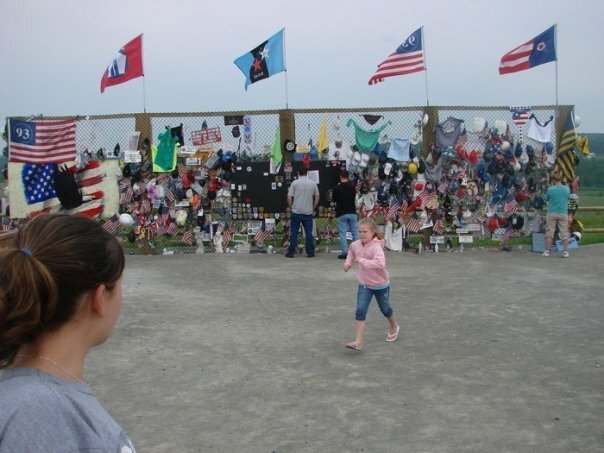 The temporary memorial at the crash site of flight 93 in Shanksville, PA.
Then we went to gravity hill, where water flows downhill – even though Aunt Dawn says it rolls uphill. The car rolls backwards down hill. 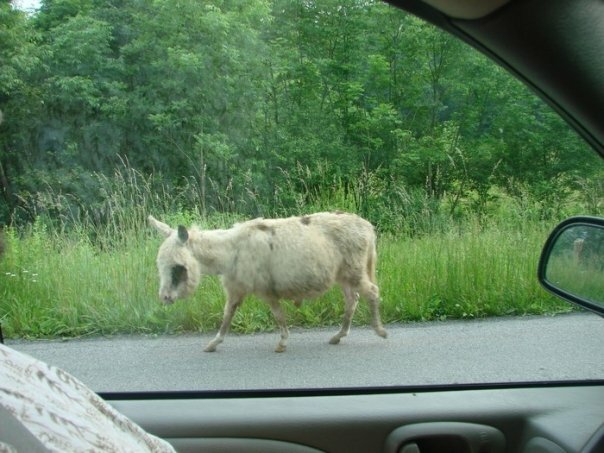 Then we went and saw a borro/donkey. Me and Jorden have a video of us going to pet the burro/donkey and we almost got mauled by a ravenous beast/dog/monster. In the middle of us running we dropped all the pop cans out of the car and left my shoe as we all piled on top of each other getting into the car. Even though we rolled downhill it was worth it because we saw a dog/monster beast. I got a little quesy after going on so many rides. Today we went to an amusement park it was a bunch of fun and we went on everything like 50 times because there was only like 7 rides but they were all fun. i got sick and thought i was gona throw up because we went on all the rides so many times but in the end i did not throw up. Me naming all of the reasons why we should not get out of the car and walk past the spooky graveyard in the dark to the old church on the hill. I mean, really! Haven’t they watched those movies? Today after the park we all went to a scary grave yard and scary church in the middle of no where because everyone except me wanted to go and see some bats and in the end we did not even see any. but when we were there i was so scared and when we were in the middle of no where we had hardly any gas so i was scard that we would get stuck out there. but we did not and we are safe in the hotel again. Me looking toward the memorial wall at the crash site of flight 93. Today was soo much fun because i almost died cause i was choking. Also Aunt Dawn, Matt, and Jorden all got chased by a big scary dog. They got chased because the were just petting a donkey that was on the road and out of no were came a big scary dog and it chased them all the way to the car, while this was going on me and uncle justin were laughing because it was so funny. Today we also went on a tour of gettysburg it was pretty fun but a tiny bit boring. After that we went to a buffet and that is were i almost died i was just eating spegitti and then i started choking it was pretty funny.after that we went to were one of the planes of 911 went down that was cool and we got to learn a little about that. Well after that we went to a place where we got pulled backwards on a road because of gravity and after that is when Jorden, Matt and Aunt Dawn almost got killed by the big scary dog and after that we went to the hotel and ate sandwhiches, and they were soooo good. well i am having an awesome time on this trip. 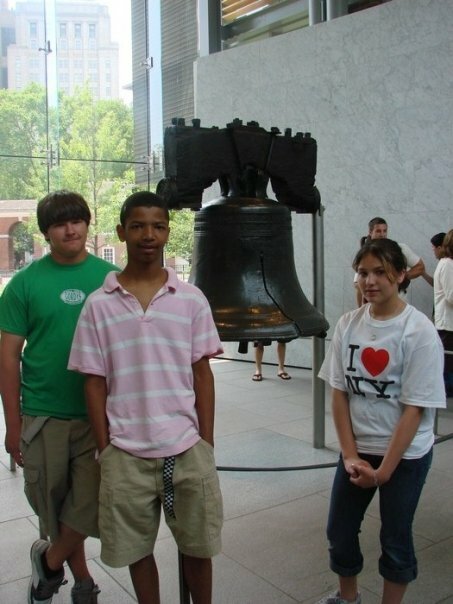 Jorden, me and Ashley at the Liberty Bell in Philadelphia. Today we went to Philidelphia and we saw the liberty bell. We saw Independence Hall building. We sang the Will Smith song on the way to Philly. Ashley, Jorden and me holding Philly Cheesesteaks in front of Genos – by far the best place to buy a Philly Cheesesteak in town. We went to Geno’s and Pat’s and we all taste tested to see which one was better. By far Geno’s was better. Pat’s cheese was barely melted and Geno’s was tender and juicy. I found half a skateboard. Then we went to the Diner Car and had Scraple. We went to Hershey’s chocolate factory and we played and went on a chocolate tour. We took pictures and drove home as it rained.